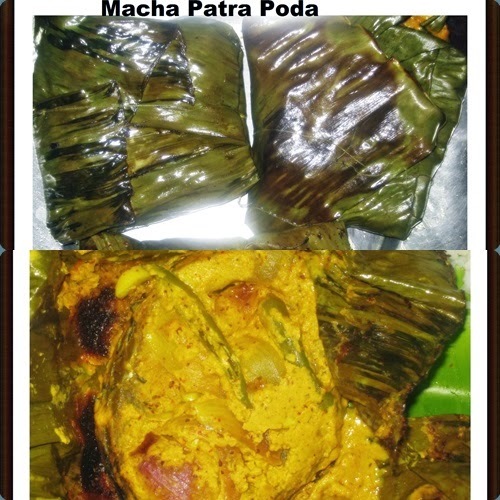 Rohi Macha Patra Poda is an unique and delicious recipe which is very famous in my state Odisha. It's an oil free healthy recipe which is goes well with hot steamed rice. Banana leaves - 4 nos. Onion cubes - 1 no. Green Chilly - 4 nos. Red Chilly - 2-3 nos. Soak mustard seeds with 2 tsp Vinegar to avoid its bitterness. Make a smooth fine paste of mustard seeds, Poppy seeds, Cumin seeds, Garlic cloves n Red chilly. Add curd, lemon juice n turmeric powder, salt to taste and keep aside. I have just fry the fish with little mustard oil for 3-4 minutes and marinate with the above masala paste. Keep aside for 20 minutes. Add 1 tsp mustard oil to the fish n mix it. Spread little oil on the leaf and grease well. Put the fish in the middle of the leaf and wrap it from all sides and tie up with a thread tightly. Now heat 1 tsp oil in the pan and put the wrapped leaf on the pan and cover with a lid. Keep the fire slow for about 25-30 minutes. At 15 minutes of interval turn the leaf other side and again cook it for more 10 minutes. Switch off the flame and Serve hot with rice.